One of the most photographed sites in Central Park is The Mall and Literary Walk. 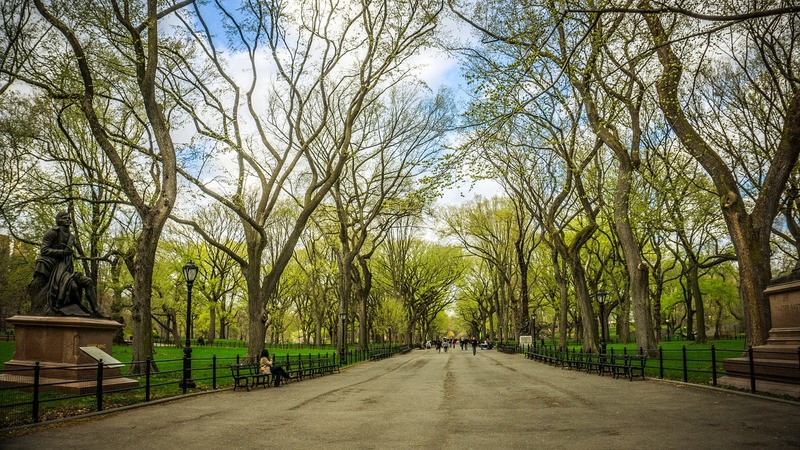 The Mall is a forty-foot wide, tree-lined path that runs from 66th to 72nd Streets. It is a straight path, which is a rarity in Central Park’s network of otherwise winding walkways. The four large statues on in honor of Fitz-Greene Halleck, Robert Burns, Sir Walter Scott and William Shakespeare. An interesting note is that the statue of Fitz_Greene Halleck, installed in 1877, was the first statue in Central Park to depict an American. Halleck was a poet who lived much of his life in New York City. The Mall leads to Bethesda Fountain, another of Central Park’s most iconic locations. Interactive Park View. Drag mouse or use arrows and compass to scroll. The Mall and Literary Walk are located Mid-park, between 66th and 72nd Streets. The Olmstead Flower Bed, a small circular garden, is located at the southern-most end of The Mall and Bethesda Fountain at the northern end. There are several park entrances with paths that lead to The Mall. The entrance on 5th Avenue between 66th and 67th Streets has a path that leads to the southern end of the mall and takes you past the Balto statue on the way.